The Pandanet-AGA City League officially starts this weekend, January 26-27. In its first year, the League features 28 teams from North American cities and regions, divided into four leagues. The teams in each league will play round-robin team matches on the Pandanet Internet Go Server. Each league’s top finisher moves up to the next higher league at the end of the season, while the bottom finisher moves down to the lower league, etc.”Pandanet has provided a generous cash prize fund for the top leagues,” reports Thomas Hsiang. In addition, the teams are encouraged to seek regional sponsors to pay for the players’ game fees and other team activities. The inaugural top leagues feature many of the best and strongest North American players. In A-League, they are: Los Angeles, captained by Andy Okun and including Beomgeun (Evan) Cho, Daniel Daehyuk Ko, Curtis Tang, and Seung Hyun (Kevin) Hong; Boston, captained by Ke Lu and including Huiren Yang, Jie Liang, Guochen Xie, and Yunzhe Zhang; DC captained by Keith Arnold and including Jie Li, Eric Lui, Yuan Zhou, and Daniel Chou; NYC, captained by Cole Pruitt and including Andy Liu, Michael Chen, Will Lockhart, and Yingzhi Qian; Vancouver, captained by Cathy Liu and including Matthew (Zi Yang) Hu, David Lu, Qi Zheng, and Bill Lin; Seattle, captained by Michael Cho and including Edward Kim Dong Baek Kim, Son, and Sung-Chul Cho. In B-League, the teams are Southern California, captained by Yanchen Sun and including Calvin Sun, Rui Wang, Yixian Zhou, and Andrew Lu; DC-2, captained by Edward Zhang and including Lin Lu, Yangang Li and Liang Yu; Toronto, captained by Colin Zheng and including Tiger Gong, Xiaofei Deng, Sarah Yu, and Hank Xie; Massachusetts, captained by Ke Lu and including Di Zhu, Trevor Morris, Yu Zhong, and Ke Lu; San Francisco, captained by Steve Burrall and including Matthew Burrall, Hugh Zhang, Aaron Ye, and Jeremy Chiu; Montreal, captained by Rémi Campagnie and including Rémi Campagnie, Manuel Velasco, Jean-Sébastien Lechasseur, and Vincent Binette. The League kick-off closely coincides with the unveiling of the new Pandanet client GoPanda-2, “A web-based client that features stunning graphics and works on many platforms,” says Hsiang. Watch for announcement of the schedule of the first round games and future news on the AGA and League websites. Hopefully the third time with be the charm for go9dan.com. Technical snafus on Monday once again derailed the Andy Liu-Lee Sedol game, which had been rescheduled from Sunday, when lag problems on the server caused Lee Sedol’s clock to run out. The game is now scheduled for this Saturday, January 26 at 8a EST. “We presume that the tech team can get the major bugs out in a few days,” says Michael J. Simon, CFO and Head of English Activities for 82 Limited, which is launching the new server. The Liu-Sedol game is the first in a 10-game series against the two new U.S. professionals, Andy Liu and Gansheng Shi, and Romanian pro Catalin Taranu 5P. The pressure is on, as the new server is also set to host the first World Go League Invitational game at 7a EST this Sunday, January 27 between Sedol and Chen Yaoye. Ten of the world’s top professionals will play for $100,000 in prizes. Organizers plan to run tests this week “where a bunch of people from different continents will play and bet on the games, chat, and generally stress our system,” says Simon. 1) The design must include “American Go Honor Society” somewhere. 2) Only use up to two colors. 3) The design should be created electronically, or if drawn should be sent in the form of an electronic copy. The AGHS officers will vote on the best design, and the winner will be notified and given a free t-shirt of their own design. Send your submission to aghsregister@gmail.com by March 1st to be entered into the contest. -Julian Erville, AGHS Vice President. Zhou Ruiyang 5P (at right, in photo) won his first international title in convincing fashion after taking down Chen Yaoye 9P (below left) 3-0 in the Bailing Cup on January 19th. Despite being rated only 5P, Zhou was one of China’s strongest pros and has played on the Chinese team in the last two Nongshim Cups. However, an international title had eluded him in his ten-year career as a pro, until now. Chen is another player who is long overdue for an international title after dominant performances in Chinese domestic tournaments like the Chinese Tengen and Chanqi Cup. His next chance will be against Lee Seedol in the Chunlan Cup final this coming July. 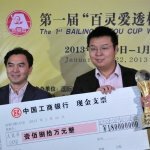 The Bailing Cup is an international go tournament sponsored by the Guizhou Bailing Pharmaceutical Group; it started in 2012 and the winner receives about $300,000 USD. The format is a straight knock-out of 64 players with a best-of-five game final. 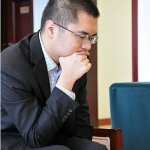 “Andy Liu 1p and Lee Sedol 9p started off a pretty interesting game this morning in go9dan.com’s 10-game kadoban (Andy Liu 1P Takes on Lee Sedol Sunday on go9dan.com) but ran aground when lag problems on the server caused Lee Sedol’s clock to run out,” reports AGA President Andy Okun. “Andy had already noted the lag problem and asked if there was a way of changing the time settings but there wasn’t.” It was agreed that the two will play a new game tomorrow (Monday, January 21) at 8a EST (5a on the West Coast) with longer byo-yomi settings. Here’s the SGF of the game up to the point of stoppage. Edward Kim 7d and Ho Son 7d — both undefeated — shared the first place honors for the open section of the 3rd Jin Chen Memorial Tournament, held Jan. 6 in Seattle, WA. Second place went to guest Xingshuo Liu 7d, who is a law student at Indiana University and said that she isn’t playing much now, and that she “was probably a stronger player when she was 12 years old in China.” The tournament attracted 32 players, with five 7-dans and three 6-dans in the open section. In the handicapped section, there were three bands for prizes: dan level, 1k-5k, and 6k+. Among the dan players, Daniel Poore placed first, Job Betcher second, and Chang Kim third. For the 1k-5k group, Jordon Betcher was first, Moon Wung Sung second, and Judith Debel third. For the 6k group, Jae Moon Kim placed first, George Schmitten second and Frank Brown third. Tournament Directors were Daniel Top and Bill Chiles. Dennis Wheeler and Andrew Jackson recorded four top games, which are posted at the Seattle Go Center website. Photo: Xingshuo Liu and Edward Kim during round 2 of the tournament. Report and photo by Brian Allen. by Lisa Schrag As visiting Americans who help run the Bay Area Go Players Association, Roger Schrag and I wanted to see first-hand how go is taught in South Korea, a country where the population is as familiar with go (called baduk in Korean) as Americans are with chess. We visited Blackie’s International Baduk Academy (BIBA), where we were greeted by friendly teachers Kim Seung-jun 9P “Blackie” (right) and Diana Koszegi 1P (left). Two years ago, they opened BIBA’s doors in the bustling Sanbon neighborhood of Seoul. The school only accepts international students, yet the system of learning go is traditional Korean. While a student there, you are living and breathing go with a daily schedule that runs from 11 in the morning to about 10 at night. All coursework is conducted in English, and people come from places such as Canada, Singapore, France, Germany, Serbia, the U.K., and the U.S. Students may also attend events, meet pro players at tournaments, and visit the Korean Baduk Association. 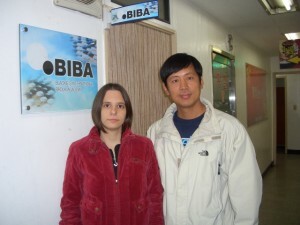 “Even if you are at BIBA for a short time, the value is in learning how to study,” explained Koszegi. The pair told us that Korean go study focuses significantly on life and death problems. “Foreigners are weak on life and death,” Koszegi continued. “They might come in as a 3d but play more like a 5k in life and death. Korean kids who are 3d play like a 5d in life and death.” Blackie plays go professionally in addition to teaching, and I asked him if doing so much teaching weakens his game. “You don’t get weaker teaching,” he responded. “Maybe you don’t have as much time to study, but you don’t get weaker.” The key is to not overplay during teaching games. Instead, Blackie waits for opponents to make mistakes. There is a traditional Korean go school for children just down the hall from BIBA, and BIBA students sometimes connect with the kids there for competitive games. There’s also plenty of sightseeing available when you aren’t studying go or playing foot volleyball and soccer with the BIBA gang: palaces, parks, biking along the Han River… For more information, visit BIBA’s website. For more about Seoul, check out Visit Seoul. Photos by Lisa Schrag.